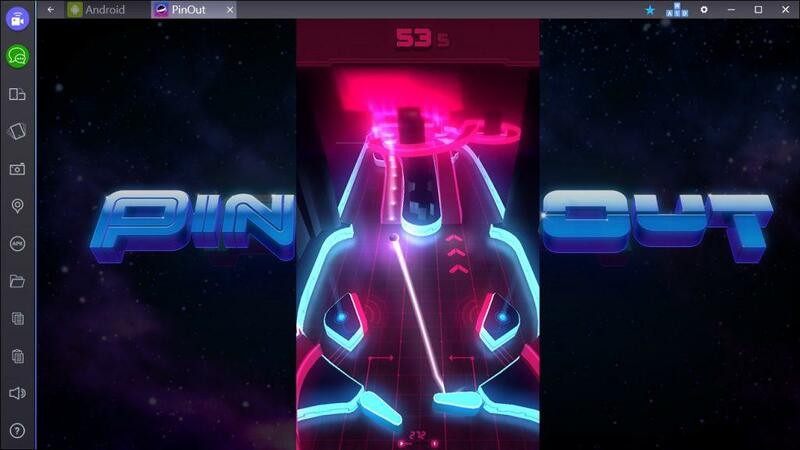 PinOut is another blockbuster brought to us by the developers of Smash Hit. It’s a reinvented spin on retro Pinball- infused with time-racing endless gaming mechanics to advance to more mysterious neon realms. How far can you go before time runs out? We’re sure you’ll be addicted… Play PinOut on phone, tablet or PC via BlueStacks and let’s get into the review! Mash-up of Pinball with endless gaming! Sweet neon graphics and buttery smooth animation! Opinion: would desire to see more goals. PinOut jumped to the top of the charts and for good reason… it takes a classic concept we grew up to love and mixed it with the simple yet difficult to master endless genre of gaming mechanics. Let’s not forget the cool Tron-like neon theme and buttery smooth animation, accompanied by electric dance track. You go for as long as you can reaching checkpoints to add time while racing the clock. It’s all about upward mobility to progress to the next challenging realm but beware some missed strokes as you’ll find yourself falling backwards. Should you download PinOut? Yes! It adds more challenge to classic pinball than just stacking up points while avoiding pitfalls. It adds an endless element to race against the clock, advancing through different maps, cool visuals and music, plus it even offers a mini game achievement. I personally would like to see more goals added, however, this opinion is in the minority to the awesomeness this game offers. BlueStacks is the best way to play PinOut on PC… download now!